1. Build underdeveloped county roads to meet new county standards. 2. Resurface and widen existing hardsurfaced county roads. 5. 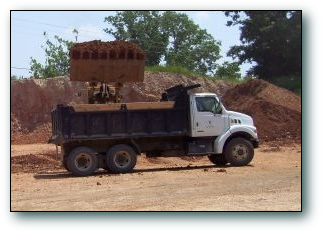 Haul base, gravel or rock to maintain gravel roads. 6. Snow & ice removal using rock/salt or sand for traction. 7. Tree removal off of county roads after storms. ( to the side of the roads * NO * pick up ). 9. Repair and maintain shoulders of the county roads. 11. Cleaning and maintaining culverts and ditches. 12. Mowing of Rights of Way. 13. Cutting trees that are on the ROW which may be a danger to the public. 14. Trimming limbs on and over ROW. PLEASE remember to contact your area volunteer fire departments and be aware of all burn bans BEFORE you begin to burn any leaves or brush. ( there are differences depending on when the county road was established however, all of them are between 20 - 30 feet ) from the centerline of the roadway. Fall : Residents are reminded NOT to burn or dump leaves on the road surface or to dump leaves and other debris in the ditches. Winter : Wait until the snow plow has plowed your road before plowing/shoveling your driveway. Do not park your vehicles on the roadway. If you are on the roadway and you approach an oncoming snow plow, SLOW DOWN and move as far to the right that is possible and allow the plow to pass safely. We also ask that you do not allow children to ride sleds in the roads or play on mounds of snow created by snow plows until the snow plows have completed their job and left the scene.